"Gian-Tony's is a great family, or date place. Across the street from Berra Park it's easy to find and far enough off the main drag that parking is not much of a problem. Not alot of people know the history... The owner Tony, was the executive chef at Giovanni's right down the street. He took his talents and opened Gian-Tony's. It is the premier food and ambiance that you would expect from a 4 star joint, but at a much more reasonable price!" "Incredible food, incredible service, and a gentle atmosphere. An absolute must for anyone visting the Hill. It's just too bad they're only open for dinner." 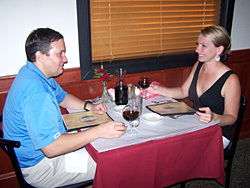 "If you want an excellent southern Italian meal with the proper ambiance Gian Tony's can't be beat. Even the family looks like they just stepped out of a Godfather movie. My favorite dish is the Chicken Caccitora. No finer anywhere in the states. They even serve my favorite inexpensive Italian wine, Santa Christina. Any trip to St. Louis must include a visit to "The Hill." "Gian Tony's is the Italian restaurant all other Italian restaurants aspire to. In particular, their cream sauces and seafood are extraordinary, but beef, poultry, and veal are also uniformly excellent. Throw in great service, a solid bar, and ambience that makes it perfect for impressing a date or clients, and you have everything you could ask for."